Most bike enthusiasts choose their pedals based on their specific riding style and preference. 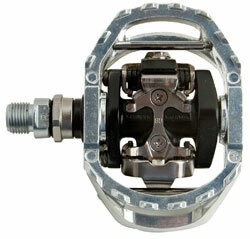 Clipless pedals are typically used by mountain bikers looking for the best in control and power. On the other hand, standard platforms are great for normal street biking and a relaxed riding style. Sure, you can choose just one, but what if you want something a bit more versatile? Dual platform pedals provide the best of both worlds. They let you switch styles at a moment’s notice without having to dig out your tools and manually changing the gear. On one side, you have the normal platform design. It’s suitable for virtually any type of riding shoe and lets you bail whenever you need to. With a flip of the pedal, you have your clipless setup. With your specially-designed shoes and cleats in tow, you can lock in for control as you fly down a trail. These unique pedals are great for guys that don’t want to be tied down to a specific riding style. They let you take the same bike out for any type of ride. There are a number of dual platform pedals available on the market, each with their own unique features. Here are the top 5 dual platform pedals. 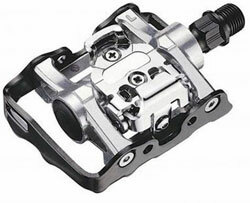 From Shimano is this aluminum pedal made for flexibility. The clipless side uses an SPD-style mechanism for wide compatibility with SPD cleats. The system is small and compact enough to be out of the way when using the platform side. The platform utilizes a concave shape and has four traction pins on either side to keep your foot stable. Regardless of where your foot is placed on the platform, you’re making contact with a pin. 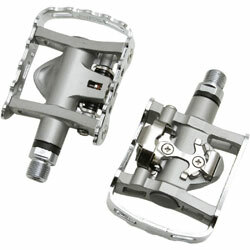 The entire pedal is made from high-quality aluminum for lightness and durability. The pair only weighs 360 grams, keeping your bike setup very light and mobile. It has a Chromoly axis that’s precisely cut with a CNC machine. Ball bearings are used to provide a fluid motion, regardless of which side you’re using. The bearings are sealed to prevent rust and damage over time. 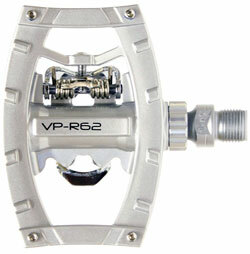 This pedal is made from the trusted brand Shimano, ensuring top-notch quality throughout. It’s very heavy and durable, weighing in at 567 grams for the pair. This added weight can help with your stroke and maneuvers as you make your way through a winding trail. Anodized aluminum is used for the bulk of the pedals. However, the cartridge spindle is made from Chromoly. The clipless side utilizes an SPD system. A cleat retention indicator and quick adjuster are built right in for ease-of-use. The opposite side is a thick platform. It has a pop-up floating cage design that engulfs the entire clipless system. Large pegs are located on the perimeter of the platform to prevent slippage in any type of environment. This unique pedal can be used with any type of shoe and looks very similar in design to that of a standard platform pedal. The main body of the pedal is made from polished aluminum for strength and aesthetic. Black aluminum is used for the platform and spindle, creating a striking look. 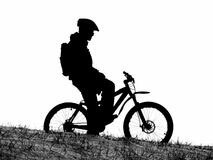 A TPE system is used for those that want to hit the trails. It also has an X cleat binding system. 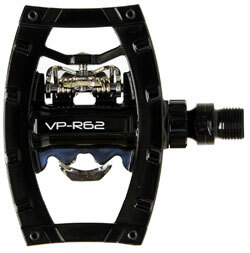 This cleat system is unique to the VP brand, but it will also fit SPD shoes for convenience. While there are no pins to aid with traction, the pedal’s unique U-frame provide adequate grip with most shoes. They have grooves and waves that are slightly raised. With its sleek black look, these pedals will fit right in with any modern bike. It utilizes an SPD system and includes cleats to get you started. For smooth performance, the cartridge axle system has Chromoly spindles that roll on LSL ball bearings. The entire system is sealed, making it virtually maintenance-free. There’s no need to worry about cleaning or constant repairs. When used with clipless shoes, the pedals provide dynamic pedaling and power to get through any trail. 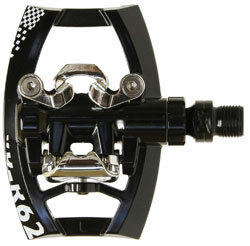 A concave platform pedal is available for when you’re not wearing the special clipless shoes. It features removable pins that let you customize your level of traction based on your needs. Between the pins are wide teeth that provide an added layer of protection. These Shimano pedals are built to last. Made from thick aluminum with a barrel finish, the pair weighs in at a hefty 568 grams. It has an SPD-style clipless system and a cleat retention adjuster. At a glance, these pedals mimic typical platform pedals. They utilize a U-frame design that wraps around the cleat system for protection and discretion. The clipless system is positioned in the middle of the platform frame to keep it out of sight and prevent discomfort. To aid with traction and stability, one side of the U-frame features a wavy texture. Instead of pins, the raised texture grabs onto the bottom of the shoe to prevent slippage. The pedals come with a pair of 2-bolt cleats. If you want versatility without breaking the bank, these pedals from Wellgo are a great option. They’re made from light aluminum coated in a sleek and protective black. In total, the pair only weighs 320 grams. The pedals feature reflectors on both sides of the platform side to increase visibility in the dark. The platform also has raised teeth rather than pins for traction. The teeth ensure that your foot makes contact with the perimeter while preventing contact with the clipless system in the center. The pedals come with SPD cleats. One great thing about these pedals is that they’re designed to be relatively small. 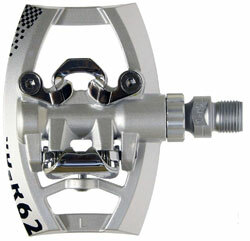 The cleat is built into the pedal, eliminating bulk and creating a low profile design. Instead of choosing one or the other, pick a model that works double-duty. Dual platform pedals are perfect for biking enthusiasts that participate in a variety of different styles. They’re also suited for men that want to take their bike on their commute to work and hit the mountain trails directly after. These unique pedals are expertly designed for efficiency and flexibility. Despite having two different systems, they aren’t bulky. The two systems are integrated to be seamless and relatively easy to use, preventing that awkward learning curve that often comes with new pedals. With these pedals installed on your bike, you can dominate any biking environment.